Recently, I wrote a post about another download accelerator for Linux users, Xtreme Download Manager. 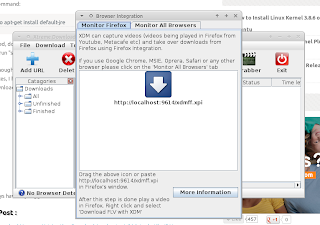 In that post, I was unable to integrate the download manager into my web browser (Mozilla Firefox). Today, I'd like to share my experience integrating it with Mozilla Firefox with you all guys. OK, let's get started! Xtreme Download Manager will ask you to install its extension for Firefox, simply drag and drop the icon into your Firefox window to install it. Once installed, please quit both Xtreme Download Manager and Mozilla Firefox application. Then, start the Xtreme Download Manager first then start the browser, please ALWAYS start XDM before starting the browser. Now, Xtreme Download Manager will be able to capture download as long as it is running.